Pay for Play in College Athletics? I’m hearing a lot of chatter these days about the exploitation of college athletes, especially those in the upper echelon of exposure in the major sports programs. 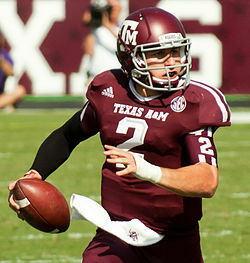 Texas A&M’s Johnny Manziel is the latest centerpiece in the discussion. It is time the NCAA consider some rule changes. First, let me be clear: I do not support direct “pay for play” in college athletics. The upper echelon athletes are already compensated for play via generous scholarships. Depending upon the school, the monetary value of these scholarships can reach well into six figures – money that most students must pay for the education they receive. Athletes should be compensated for their time when the university asks them to attend events not directly related to their athletic endeavors. For example, if the athlete is asked to appear at an alumni fundraiser to drive attendance and contributions at the fundraiser, he should be compensated for his time. Athletes should be allowed to profit if their name and/or image is marketable. Johnny Manziel was suspended 1/2 a game because he allegedly sold his autograph to an autograph broker. This is capitalism at work! If his name and/or image is marketable and the school isn’t damaged by the activity, he should be allowed to sell his autograph or image and be compensated for it. This principle should also apply to Olympic athletes. Athletes should receive a share of profits derived from the sale of licensed apparel and other items bearing their name or likeness. Athletes should be allowed to consult with agents or other professionals for these endeavors. There are sharks in these waters, therefore there should be a qualification process for such professionals to protect the student athlete and ensure legality and objectivity. If they don’t already, colleges and universities should have professionals on staff for the purpose of counseling and advising athletes and other students on how to deal with their new-found fame. I am an enthusiastic fan of college athletics. We fans root for our teams in the same manner in which we root for our favorite professional sporting teams. College athletics generate millions of dollars for their schools, and when an institution is blessed with an athlete of Johnny Manziel’s ability, the income increases even more. It’s time to review the rules. College athletics is big business. It’s time to let the athlete share in the profits. It’s time for change.